High performance 100% Synthetic lubricant specifically designed for powerful and recent cars fitted with large displacement engines, Gasoline and direct injection turbo Diesel. Multipurpose product featuring numerous car maker approvals, especially recommended for vehicles still under warranty. Suitable for all type of fuels: leaded or unleaded Gasoline, Diesel and LPG. Compatible for catalytic converters. The ACEA B4 performance requires an outstanding detergent/dispersant power and a better viscosity increase resistance due to soot produced by Direct Injection Diesel engines (except VW unit injector engines that require a VW 505 01 product such as MOTUL Specific 505 01 502 00 505 00 5W-40 or 8100 X-clean 5W-40). The BMW Long Life-01 specification imposes severe constraints to the lubricant particularly due to the Valvetronic system. It covers all BMW engines from 2001 to 2004 and also all the previous BMW specifications such as BMW LL-98. From 2004 BMW vehicles require a BMW LL-04 product such as MOTUL Specific LL-04 5W-40, 8100 X-clean 5W-40, 8100 X-clean 5W-30, or 8100 X-clean+ 5W-30. BMW LL-01 standard covers also all Gasoline engines running only outside European Union countries, Switzerland, Norway and Liechtenstein. Refer to BMW recommendations when in doubt. GM-OPEL Diesel LL B-025 standard requires two main properties from the lubricant: high HTHS and very low volatility to drastically decrease oil consumption. 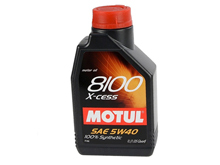 MOTUL 8100 X-cess 5W-40 is especially recommended for OPEL Diesel engines such as the 2.0L and 2.2L DTI engines (extended drain interval : on-board computer). The MERCEDES MB 229.5 standard is more stringent than 229.3 in terms of ageing and oil film resistance (extended drain interval: on-board computer), detergent/dispersant power (ACEA B4) and requests fuel economy performance: 1.7% fuel economy improvement versus a 15W-40 reference. The specification MB 229.5 applies to all MERCEDES Gasoline engines, including AMG (in 5W-40 viscosity grade) except SLR, and to all MERCEDES Diesel without DPF engines. The Porsche A40 standard requires extreme high shear resistance from the lubricant. This specification applies to all PORSCHE engines, except Cayenne V6 and Diesel versions (for these specific engines, use an approved Porsche C30 lubricant such as MOTUL 8100 X-clean+ 5W-30). RENAULT has developed RN0700 and RN0710 standards for oils able to endure the most severe thermal constrains along with modern after treatment systems compatibility. The Renault RN0700 standard applies to all Naturally Aspirated Gasoline engines (except Renault Sport) of RENAULT Group (Renault, Dacia, Samsung). The RN0700 specification applies also to all RENAULT Diesel cars fitted with 1.5L dCi engines without DPF (Diesel Particulate Filter) having less than 100 hp output and 20 000 km or 1 year oil drain interval. The Renault RN0710 standard applies to all turbocharged Gasoline, Renault Sport and Diesel without DPF engines of RENAULT Group (Renault, Dacia, Samsung). The RN0710 specification does not apply to RENAULT Diesel cars fitted with 1.5L dCi engines without DPF having less than 100 hp output and 20 000 km or 1 year oil drain interval which specifically require a RN0700 lubricant. For the 2,2L dCi with DPF, use only an approved RN0710 lubricant, not a RN0720. The FIAT 9.55535-H2, M2 and N2 performance levels impose the engine oil to combine both ACEA A3/B4 standard and 5W-40 viscosity grade in order to perfectly lubricate most of the Gasoline and Diesel engines of FIAT, ALFA-ROMEO, and LANCIA produced before July 2007.